The French Bulldog Rescue Network is an amazing organization dedicated to, well, rescuing French Bulldogs. 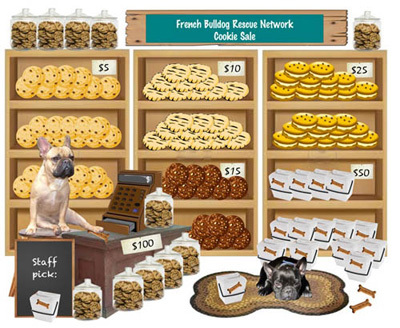 Contribute to the cause by participating in their “virtual cookie sale.” The batpig loved his pretend peanut butter cookies!! [quote style=”1″]Our volunteers are out knocking on doors and offering their friends and neighbors the opportunity to participate in the first FBRN Virtual Cookie Sale! But what if you don’t know a volunteer? What if you really, REALLY want a virtual chocolate cookie with macadamia nuts and white chocolate chunks but there’s not a cookie salesperson in sight? Virtual chocolate chip cookies are only $5. Pretend Peanut butter cookies are $10. Those chocolate macadamia white-chocolate chunk cookies you heard about are $15. Safe-for-your-waistline Sandwich cookies are a mere $25while virtual dog biscuits for an FBRN foster dog or your own happy dog are $50. An entire cookie jar full of delicious, fat-free, imaginary cookies is a steal at $100! Our cashier, Pamplemousse, and our greeter, Lugnut, are waiting to help you with your order! This week, FBRN has taken in another 10 dogs. That’s 10 well-Frenchie visits at the very least, and of course, there will be a few spays and neuters and medications for ear infections and for other problems the dogs acquired in the puppy mill or the pound or on the highway as they made their weary, footsore way to rescue. via French Bulldog Rescue Network.